ATLANTA -- An Atlanta gym owner has banned police officers and military members from working out at his facility. Jim Chambers put up a sign on the door of EAV Barbell Club that used an expletive to announce that police aren't welcome there. Chambers tells WXIA-TV that his gym has "had an explicitly stated 'No Cop' policy" since it opened. He says active members of the military also aren't eligible for membership. 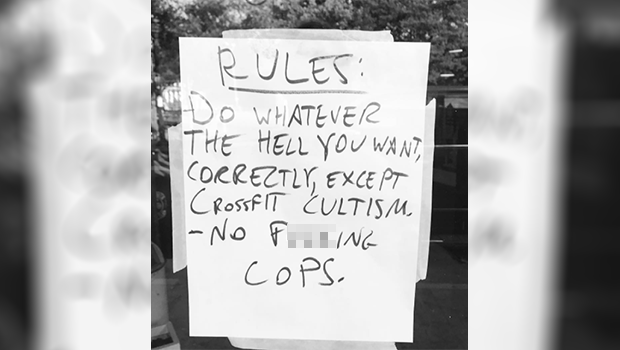 The gym posted a photo of the sign on its Instagram account with the caption "We simplified our membership policy." The Atlanta Police Department tells the station that the policy wouldn't prevent them from responding to an emergency at the gym. Chambers says he's taken the sign down due to its vulgarity, but plans to replace it with a clean version. He told the station that people who work out there are generally minorities who are uncomfortable with law enforcement.